is paris always a good idea? : Day 205: Quel Malentendu! What a chilly and gloomy Saturday it was today here in Paris. For the first time of the season, I had to turn my expensive heat up to maximum, wrap myself up in an oversized knit scarf and keep a constant kettle of violette-rose tea on the burner in order to stay cozy and warm. Major Brrrsville. I arrived at La Perle minutes later to find Eric sitting at the bar with a glass of wine for him and one waiting for me. The story with Eric is that I met him when I first moved to Paris back when my uncle was coming often for business and Eric was the driver provided by my uncle's company to take him to his meetings and dinners. Jumping at any opportunity to abandon my watered-down soup in the box for nice dinners in the 8th, Eric used to pick me up at my teeny-apartment at La Motte-Picquet to meet my uncle where I'd feel fancy for the evening. Since Eric is a professional driver, he passes my often office where when I've had enough of being accused of being an untalented photocopier, I'd sneak away to meet him at the corner brasserie for a quick coffee. He used to come around more in the spring during heavy tourist season and unfortunately for him, during the crux of my heartbreak where he'd console me because I couldn't hold back my tears. I never believed him when he told me that everything was going to work out just fine. He was right. The corner brasserie by work has now become an after-work staple for me to go to where I have a glass of wine or noisette with my book before descending on to the packed métro during rush hour. Due to the fact that the neighborhood where I work is very commercial, the cafe is empty by 6:30 pm, leaving just me and the owner, Sylvie in the quiet restaurant. Over time, Sylvie and I started talking to one another where I eventually opened up about my story. She always stayed quiet and listened during this part of our conversation. After months of going to what I now call chez Sylvie, she finally gave me her opinion about my situation. She told me that it wouldn't have worked between me and my ex because he was already married and my thought that I should find someone who was available. Excuse me? My ex was already married? How did she know MF? Was this where he met up with his secret wife? Wait, what? Back up! Then it hit me, oh mon Dieu. This entire time she thought that I was having an affair with Eric! Oh my god. No, no, no! She thought that he was consoling me in the café over the fact that he was married and that we couldn't be together! No! No! No! I'm not that girl! I had to explain that Eric and I are certainly not having an affair, that I was crying over my ex and the current state of my life, and that I have in fact met his wife several times who is quite lovely. This, ladies and gentlemen, is how rumors are started! Eric has become a friend of mine here in Paris and don't see him as often as I'd like but when I do, it's special. After our lunch at La Perle, we walked over to the Pompidou to check out the Edvard Munch exhibit and couldn't help but laugh because we got stuck behind tourists who took photos of each piece. The last time I saw Eric, I told him that I thought I'd be leaving Paris for good because I thought it would be best for me and perhaps one day I would return to The City of Light. Fast-forward nine months later and I'm still here, I guess I'm like Cher - I never go away. As we we were standing on the top of the Pompidou center looking out to a foggy and cloudy view of Paris, he turned to me and said, "I knew you weren't going to quit Paris. This is the real love of your life." Again, he was right. It's going to take a little more then some bad luck, failed friendships and relationships to leave the real reason why I came here: my love for Paris. Everyone should have a friend like Eric - he sounds like a very perceptive guy. And thank goodness that MF wasn't married - Sylvie's comment really made me sit up and pay attention. I started thinking, "How did I miss that ?" Thanks for reminding me that I still need to go to the Edvard Munch exhibit. And brrr...your heat isn't included in your monthly fees? And yeah! I can't believe Sylvie thought that Eric was my "situation"! Oh la la la la la! After I explained that I wasn't sleeping with someone else's husband, she warmed up...and rightfully so! But crazy, huh? I love that you have a friend like Eric. 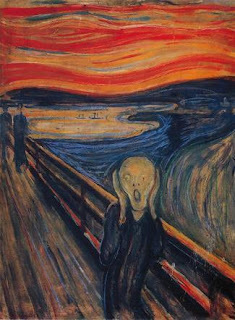 I wanted to see the Munch show when I was in Paris but I didn't have time. :( I'd love to stay in France as well but I don't know if it's possible if I don't obtain a working visa (mm, impossible). I don't know how Americans do it! I think it takes a little luck. It's cold up there? It's been strangely warm here.. this weekend the ski resorts were supposed to open but everything has had to be postponed because there's no sign of snow or cold weather. Glad to read another lovely post! Missed you! @D - Thanks! You missed me? I didn't go anywhere! : ) Or was it you who went somewhere...did I miss a blog post? Eric is awesome, he really is one of my favorite people in Paris. His wife is a lucky lady! He just absolutely adores her, c'est chou. As for your Visa, why don't you get a student Visa that permits you to work 20h a week? There are many options, the long sejour visa requires proving you have bucks and you can't work on this visa. There are options...don't leave because of administrative stuff! Are you going back to NY for the holidays? "You'd enjoy the Edvard Munich exhibit...I felt like you going there...I was thinking "this is soo MK"! : )"
Ahahahah LOL! We didn't really care, we were laughing because it was preventing us from rushing through the entire exhibit! Can't wait to read your post about it! Nope I'm here for the holidays! Not going home for Xmas. 2nd Xmas in a row in France. :-) I have no desire to go home. Ever. Toi? Student visa.. I'd have to go back to school! Need $ for that, and I have no idea what I'd study! Doesn't make much sense to me now. Having an xmas party this Saturday night. Wish you could come! Oh, yeah I missed you.. missed your last post. Whoops. STILL haven't updated the blog, moi!